Pastor, do you have a clear picture of where you believe God is taking your church? Many times, as pastors, we have a pretty good picture of our unique future. However, if the rest of our team lacks clarity, then our vision may begin and end with ourselves. We want to walk you through a process that will help clarify vision and mission, ignite your team, and set you on God’s unique path for you and your church. 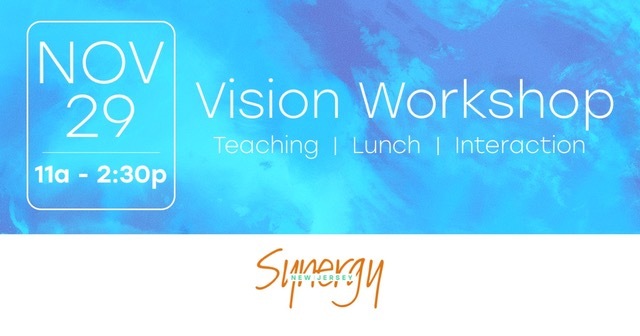 Synergy NJ is a free 3.5 hour workshop designed for you and your team to get a great picture of where God is taking your church. We will be meeting around a free catered lunch! This workshop is for pastors first, but there is incredible value in bringing as many folks from your leadership team as you can. The first 30 registrants will also receive a copy of Will Mancini’s Church Unique. Kevin Marsico: Kevin Marsico is the Senior Pastor at NorthStar Community Church in Monrovia, Maryland. Kevin has been the Senior Pastor at NorthStar since its inception. Kevin brings relevant, Biblical truth to his Sunday messages and inserts humor, passion and insight into his high-energy teachings. Kevin and his wife, Sandy live in New Market, Maryland with their four children.